Ace Bouncing Castles will be closed on the 14th of April till the 26th of April..
Have you been looking to transform your next event into something truly spectacular? Sure, the food is an important factor in any party’s success, but just as (if not more) importantly is the entertainment! If you’re searching for something that’ll put the fun back into your guests’ lives, you’re in the right place. We supply a wide variety of kids and adult jumping castles for hire for any occasion, each of which has its own special features. There are so many different themes available, including Disney options, obstacle jumping castles, and choices with a combination slide included. With such a large selection, there’s something that’s sure to please everyone, whether it’s kids or adults. For the proverbial icing on the cake, we can also provide the machinery and everything else needed to run either (or both) a fairy floss and popcorn machine. We’re here for you from first point of contact until after we’ve packed everything up when the party is over. Our friendly and knowledgeable staff will work with you to arrange the booking time and date, and we’ll make sure the whole process of delivery, set-up, and pick-up is as smooth as silk. 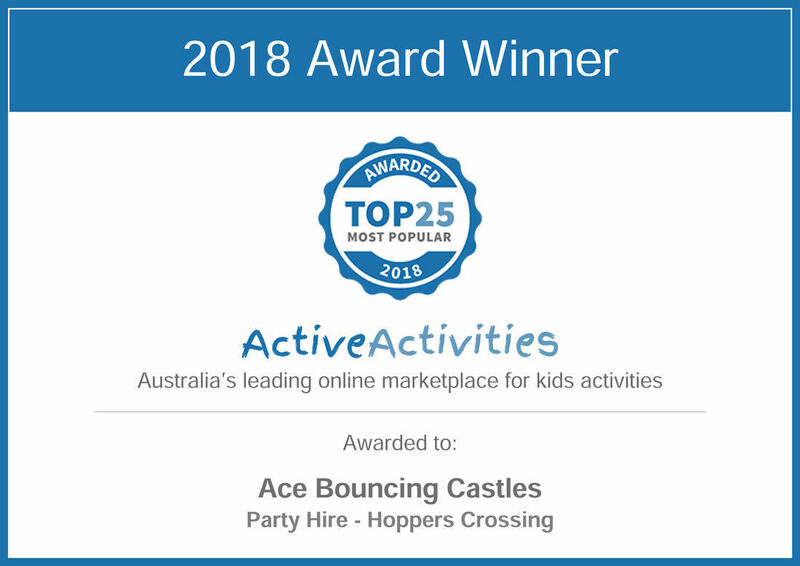 Whether you’re looking to hold a small event or a full-blown party, we have a number of cheap jumping castles for hire in Melbourne in the Western Suburbs. Let us give your special occasion the fun, light-hearted edge it deserves. Speak with us between 9am-5pm Monday - Sunday on 0407 322 769. We’re always more than happy to lend a hand and provide you with recommendations to assist with your next big event. Alternatively, click here for our Facebook page to stay up-to-date with all things Ace Bouncing Castles!